Have you ever tried to explain to someone that isn’t from the UK what a pantomime is and why it is such a part of the Christmas celebration? Obviously, if you are talking to an American, it’s fairly easy. Point at the White House and they will get the concept of pantomime very quickly. Given a conversation I had recently, it’s not that easy to get the concept over. So, my advice is to forget trying to explain and take your interlocutor to the King’s Head where Charles Court opera are putting on their Christmas pantomime King Tut. Egypt 1922 and explorer Howard Carter (Matt R J Ward) is looking for the tomb of Tutankhamun. His party consists of Lord Conniving (John Savournin/Matthew Kellett) who is financing the expedition, and is attending along with his ward Evelyn (Francesca Fenech). There are also a couple of locals in the shape a Porter (Philip Lee) and his son (Alys Roberts/Jennifer Begley). Carter and his team are getting closer to the tomb, but not everything is as it seems. The camp is alight with strange happenings this evening. Unrequited love, strange sounds – and accompanying smells and the evil laugh of one who may turn out to be a dastardly villain. What do the fates, the gods and the Eye of Horus have planned for our intrepid traveller and will they ever recover from meeting Colin? Yes, Charles Court opera pull the rabbit out of the hat once more. Whilst other production companies are gleefully regurgitating Cinderella, Snow White, etc writer John Savournin along with lyricist David Eaton make an exciting, and entertaining show out of the search for King Tut. Does the show stand up as a panto? Let’s check the list. A completely mad plot – yes, cross dressing – yes, a larger than life villain and a loveable hero – yes, the worst ‘dad’ jokes and puns ever heard – you bet, well known songs with new comical words – yes audience participation (including a sing along) – oh yes. Everything is ticked. John and his team have pulled together a great story that works for adults and children alike. Sean Turner has designed a great set that has turned the stage at the King’s Head into a really lovely, old fashioned proscenium-arched theatre and, when combined with Mia Wallden’s costumes – especially a particularly amazing one in Act II – the stage is et for a right good traditional panto. A great show needs a superb team to deliver it and King Tut certainly has that. The five actors pack so much into the roughly two hours of the show that it’s impossible to take your eyes off the performance for even a minute. And there are some tremendous performances. Bruce Forsyth may have gone to the strictly ballroom in the sky but last night he was alive and well (sort of) in the highly talented form of Philip Lee. There’s also Aly Roberts who may not be tall but whose voice really packs a punch. I would mention John’s performance but in many ways, he needs to be seen to be believed, so I’ll pass over him and quickly give a wave to Matt R J Ward and Francesca Fenech in their roles as potential star crossed lovers trying to get over various hurdles in order to be in the right place at the right time. All told the acting is great and there is a lot of fun in the performances – some occasional corpsing and friendly banter ad-libbing adding to the general good natured humour. I understand that King Tut is the last panto being performed at the current King’s Head – this time next year they should be in their new Islington home – by Charles Court Opera and they have really pulled out the stops to produce a truly excellent show. As always, there is more than one version of the show available to see, with child friendly and adults only options being performed over the course of the run. I have to say, I loved every minute. I laughed, I cried, I groaned at the jokes and sang along with gusto when needed – as always, our side of the auditorium were so much better than the other. When the time came, I cheered and booed along with everyone else and, for a brief moment in time, I was no longer a tubby little bloke on the wrong side of 50, I was a bespectacled child once more, having a truly awesome time at the pantomime. 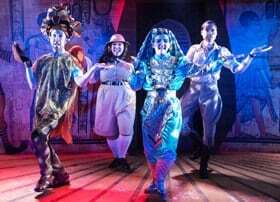 Boutique panto masters Charles Court Opera return to the King’s Head Theatre for a third year of pun-tastic, panto-tastic fun with the world premiere of King Tut – A Pyramid Panto. A now legendary part of North London’s Christmas, Charles Court Opera’s seasonal pantos are always cheeky, topsy-turvy retellings of myths, legends and fairytales. Expect both the expected and the unexpected, with fabulous musical numbers that add spark and bite to the slapstick, groan-worthy jokes and off-piste silliness, mixed up in an inventive cocktail of magic, love, baking and cross-dressing. Director John Savournin, Musical Director David Eaton, Costume Design Mia Wallden, Lighting Design Nicholas Holdridge.